Maelyx Nocturne was born to the Kupolole Tribe in South Africa, near Cape Town, as the product of an arranged marriage between her tribe and a neighboring people. 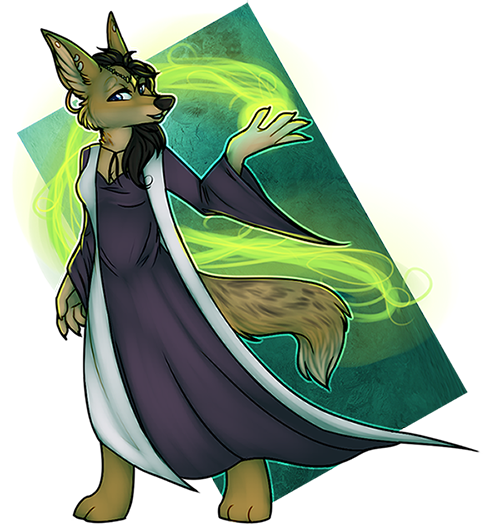 Trained in the mystic arts, Maelyx was convicted of treason when a prophecy went wrong and she led the tribe's heir to his death. Her mentor was killed protecting her, and she barely escaped with her life. Fleeing to Cape Town on the back of her stallion, Bogomo, she bartered last-minute passage and sailed to North America. Shortly after arriving in Souls she joined Anathema, and began to climb the ranks of the mysterious, subterranean pack, taking Avinalora Phoenix as her mate, and having arranged pups with Lux Einar. After the fall of Anathema, she briefly led the coven, The Circle of Ravenshadow, before leaving her mate and her family to join Salsola after interpreting signs from the gods. 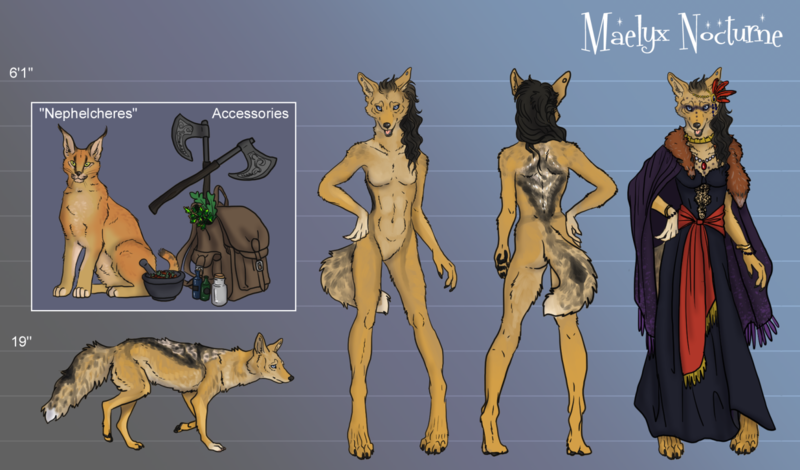 Maelyx’s coat primarily resembles the traditional coloration of the Black-backed Jackal, but due to her mixed heritage her fur is slightly thicker and her features are finely washed with the creamy tan fur inherited from her mother, who was a Golden Jackal. If not for the particular style of dress and armaments she prefers, everything about Maelyx would be completely ordinary. The kind of face to blend into the crowd, and disappear from memory when she was gone. Although in general appearance her Black-backed genes are dominant, her size reaches more to that of a Golden Jackal. In a world full of wolves she was merely of diminutive stature, but in the land of the black-backed jackals she would be taller than most. As a Luperci Verto she began her life without the ability to shift, and without the ability to take part in the pleasures of a world with long dexterous limbs and capable hands. It is evident in her dress that she is making up for lost time, wearing extravagant clothing which many would say resemble that of a witch or shaman. In Optime she stands 6'1 to the top of her head - her ears peek over that height by a bit - and has a thin, slightly shapely body. She is never caught without the adornments of bone jewelry and feathered headdresses. She lets her sable mane grow long and wild – the more unkempt, the more room for jewels, beads, ribbons and feathers. Her unkempt tresses normally fall halfway down her back and over her shoulders, framing her face in shadow and highlighting her eyes that are so unusual for a jackal – the cold, ice-blue depths of which seem to drink in the world around her with striking acuity. Maelyx is a bit of an anomaly. At first glance, her darker features and penchant for gloomy fashion suggest a less-than-friendly bearing, but truthfully her constitution rests on the side of lawful-neutral. She is more likely to stick to what is morally righteous – but then again, that is where her own code of morals and ethics are concerned, and they may not quite fit into someone else’s box of principles. She’s been called a witch, heretic, and enchantress by many, and they were not wrong. 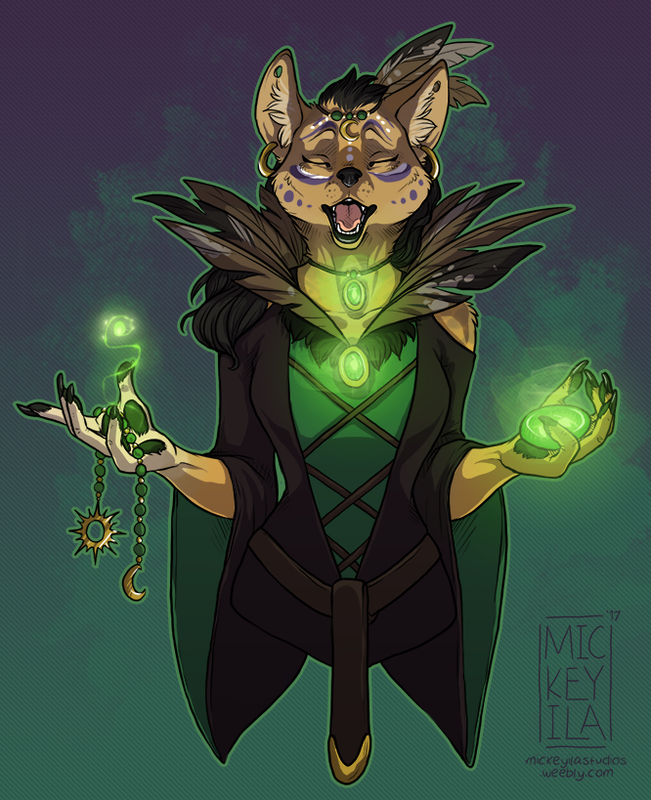 Her knowledge of the obscure arts of witchcraft and sorcery is vast and expands daily, with each ritual, divination, or spell performed – no matter what its efficacy. She is friendly enough, for alliances are invaluable, but too many close relationships can become liabilities. Having had loved ones used as tools against her in the past, she carefully scrutinizes those around her and normally only lets the strongest of individuals become her close friends. Her heart is not closed off, but for now she is more interested in honing her craft than looking for love. She believes there is power in sensuality, and has no problems with keeping casual lovers. Most situations she approaches with careful forethought and cunning. She can strategize, and has a mind for politics, though she finds it daunting. Almost every new situation she comes upon she consults the spirits through divination – typically using her Ogham runes or tarot cards. True to the witch’s way, she is open to finding a pupil or sharing bits of arcane knowledge with true believers. 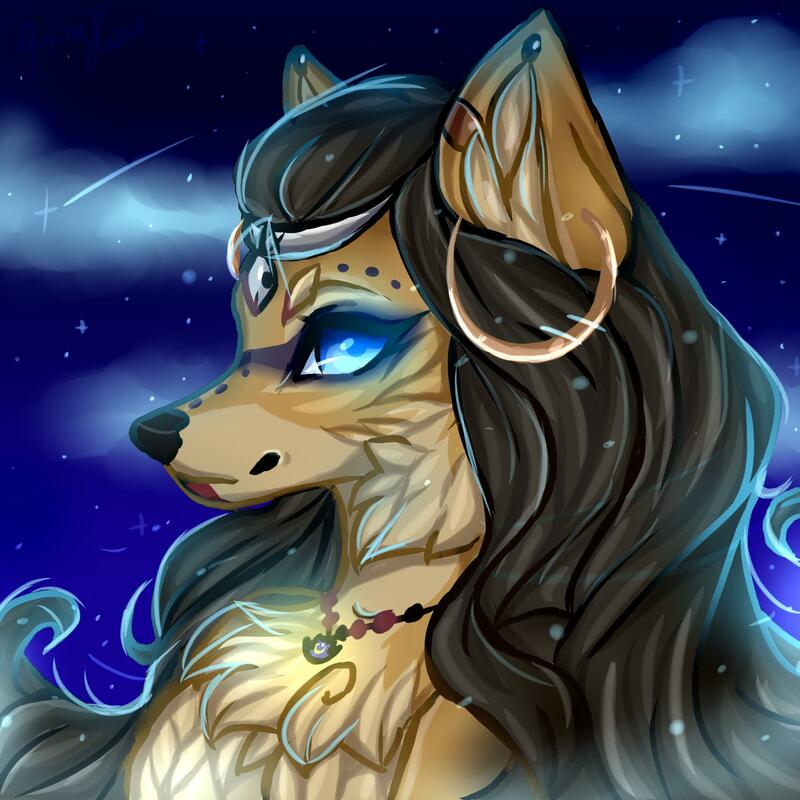 Born in Kupolole, a port village in South Africa near Cape Town, Maelyx was born to a black-backed jackal named Orphamiel Nocturne, and golden jackal mother, Araminta Wild-As-River. Their union was part of an arranged marriage between two tribes, to unite them after a three year war. The tribes engaged their two Onveranderd Een (unchanged ones). Their first litter would bring forth the pure ones, and on their second name day two would be chosen to be bitten by the Luperci leaders of each tribe in the final union of their people. Of the four pups in her litter, Maelyx was one of the two Gekies, the ones chosen to be turned to Luperci. Maelyx never felt like her life meant much beyond being a living symbol of the union of the tribes. Her sole existence and purpose was simply to remind those of her tribe of the union with the Malgune, while her brother Hadraniel – the other Gekies – lived as her counterpart in the Malgune tribe. After being turned into a Luperci she became obsessed with the beautiful things that the traders of Cape Town bartered. She traded for silks and gems, jewelry, and blank journals and candles. After meeting up with a gem miner in Cape Town, she had a brief apprenticeship in a nearby mine digging for semi-precious stones and selling them to the jewelers – until she began to make jewelry on her own. It did not take long for the Wyse Ouer of her tribe to notice Maelyx’s frequent wanderings. Days spent away turned to weeks, and when the girl came back she’d be dustier than ever before, little glittering gem-dust in her fur, and a new bag of trade goods slung over her shoulder. This girl was bright, meant for something, and clearly, her purpose was not being fulfilled in the tribe. The Wyse Ouer knew it would be detrimental to the unification with the Malgune for Maelyx to decide to wander away forever, so appealing to the girl’s intelligence, the Wyse Ouer, who Maelyx came to call Meesteres (mistress), began to teach the Gekies girl the secrets of the witches. An apt pupil, Maelyx came to love the craft she honed. Her experience mining gems came in handy, for the Wyse Ouer taught her about the magic these gems held, and the power that flowed through them. They were much more than simple rocks to be traded now; they were a connection to divinity. She also learned the herbal arts; how to poison, how to heal, how to strengthen, how to use the spirit of nature and plants to help her tribe gain favor in the eyes of the divine. She sacrificed animals and made runes and divination rods from their bones, and made jewelry of their pelts and claws. She was taught to never let the meat go to waste; once she drained the blood for her purposes and flayed the meat from the bone, it would be turned over to the tribe’s cooks to be baked into meat pies. One evening before leaving on a diplomatic mission to a neighboring village, the chief’s son Pyrorus came to her asking to know if his mission was favored by the gods, and if he would be safe in his travels. This was a fairly normal request, and Maelyx obligingly tossed her runes and then laid down her tarot cards for clarification of the runes’ message. Everything was to go according to plan; the heir’s mission was favored, he would have successful negotiations and would return safely to Kupolole. Only, things did not go according to plan. A fortnight after the heir set out on his diplomatic mission, a lone envoy returned. It was Usiu Terra, the chieftan’s son’s best friend and right-hand-man. He was badly injured, his golden pelt russet with the dried blood from slashed wounds. He was ushered to the chief immediately, and reported that they had walked right into a trap. 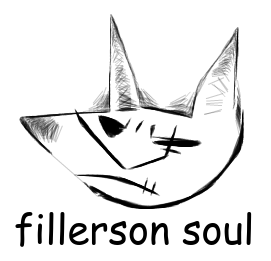 The neighbor village had faked their interest in the alliance, and slaughtered the party when it arrived – only he and Pyrorus survived… for a time. Usiu knew not what they had done with Pyrorus, only that he had listened to the man’s screams for a week, and then one day, just silence. When Usiu was marched out of the village and sent back to Kupolole as a message to the chief, he was marched past Pyrorus’ battered, bloodied body hanging lifeless from a border tree. Usiu died of his wounds just hours after returning to the tribe. Wracked with grief, the chief and the people of Kupolole needed someone to blame for this betrayal. Though he himself had been the one to send his only son on this mission, claiming he needed to gain experience in diplomatic matters, he pointed his finger at the one who told them they would be safe; Maelyx. He accused her of conspiracy and treason, claiming she was in league with the enemy and had knowingly and purposefully sent their ambassadors and the heir to their deaths. A witch hunt ensued. With grief in her heart, Maelyx escaped to Cape Town where she bartered passage onto a ship with several of her gems. She knew nothing of the new world to which she sailed, what or who would be there, and if she would survive. For extra coin and the appointment of ship chores, she also purchased the Boerperd horse’s passage on the ship. The ship first followed Del Cano’s route to Portugal, docked for a brief time, and then crossed the Atlantic to North America, where the ship arrived in Boston Harbor. Seaching for a new life and completely skeptical that she would ever truly find one, the jackal and her Boerperd horse followed trade routes up to the pack-populated lands of Nova Scotia; perhaps here she would find a new start. But could she ever forgive her tribe for the betrayal? Could she ever forget the Wyse Ouer’s sacrifice for her? Certainly she knew she would be caught and killed for coming to Maelyx’s rescue. And the one question that truly haunted her every waking moment, and every dream, and every step… would she ever be able to trust anyone ever again?